I mean that literally . . . can you dig it? Like a big hole in the back yard for a swimming pool. Or a little hole in the front yard for a new mailbox post. Or a medium-sized hole in the side yard for a nice shade tree. Even if the ground is soft enough, and even if the shovel is sharp enough, and even if you’re strong enough . 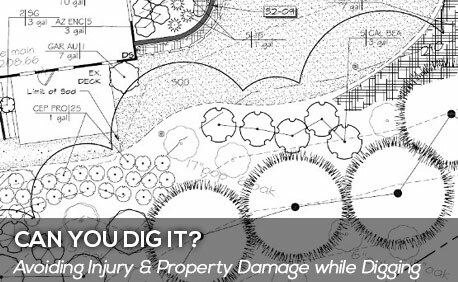 . . don’t dig until you’ve been smart enough to call 811, a free service for homeowners, excavators and contractors who plan to dig, grade, drill or excavate. This is to keep you from cutting into a buried utility line. Damaging underground electric or gas lines can cause fires, and cutting into an electric line can cause electrocution as well. The Common Ground Alliance reports that underground utilities in the U.S. are accidentally severed every few minutes. That makes for a lot of potential pain and suffering.